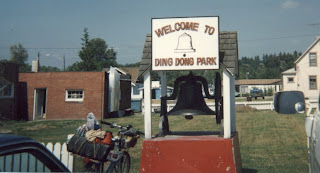 Old bell in Ding Dong Park, Sylvana, WA. I decided to put a lot more pictures on the net. My favorite from trips I hadn't made web pages for. Flickr is a good way to show them. For all my landscape photos go to album main page. 7th and 8th grade. Some trips that were 30 miles out from my home town of Pullman, WA. High school, College trips around town. Camping trip to the top of Moscow Mountain near Pullman. Early 80s Bellingham to Seattle. 1985 Bellingham to Pullman - didn't bring a camera. 1986 - 1989 Around Northwest and down west coast. In this collection on Flickr. 1990 Short trips around Northwest Washington. 1991 Across USA. On it's own web site. 1992 Washington and Oregon. In this collection on Flickr. 1993 Across USA. On it's own web site. 1994 - 1997 Around Pacific Northwest and parts of BC. In this collection on Flickr. 1998 - 2006 Variety of trips with their own web sites. 2007 Around Washington. On Flickr.